Please promote this theme for events everywhere this Summer 2015! 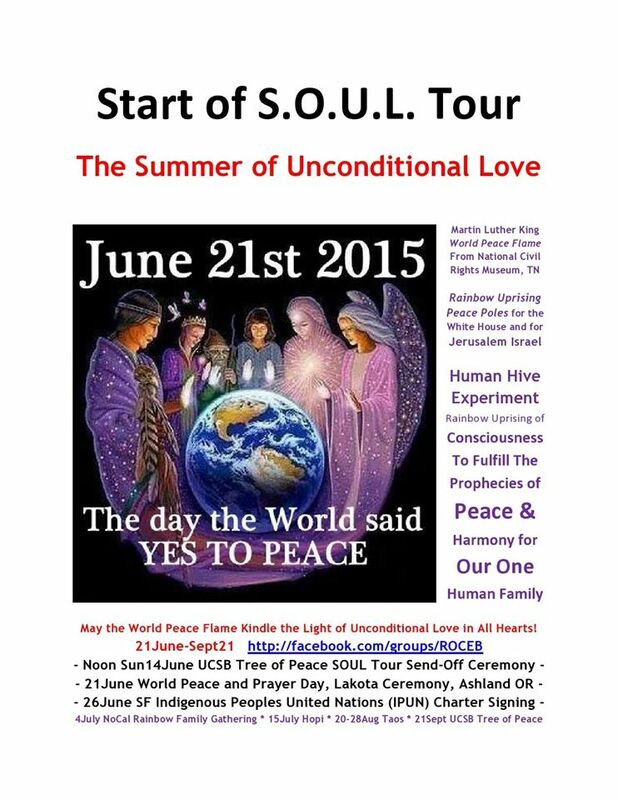 June 21st 2015 – The day the World said YES TO PEACE! May the World Peace Flame Kindle the Light of Unconditional Love in All Hearts! In 1980 at the end of the Long Walk for Survival from San Francisco to Washington DC, I introduced a blank log to become the Peace Pole for The White House into the end ceremony with many people chanting and drumming the Na-Mu-Myo-Ho-Ren-Ge-Kyo universal medicine word mantra with the Most Venerable Nichidatsu Fujii across the street from The White House in Lafayette Park. Fujii Guruji, as Mahatma Gandhi called him after taking up this same drum and mantra in his daily prayer practice, on our request had one of his monks inscribe the mantra calligraphy on that peace pole on which many symbols of peace were later added during its lifetime and use and many events including Rainbow Family Gatherings until it got too old and worn out and was burned in the Spring of 2015 by Felipe Chavez at his ceremonial grounds in Florida, as had been suggested years earlier because it was being misused by people as some kind of art object for personal purposes instead of as simply as symbol of the message of peace. In August of 1994 at the World Unity Festival near the Grand Canyon a blank log was introduced to become the Peace Pole for Jerusalem. The story of its introduction to lightning and thunder is explained at the link below, but it too was destroyed after many years of not being able to fulfill its mission. Therefore a new style of peace pole was created in early August 2014 and first introduced as the Rainbow Uprising Peace Pole at the National Occupy Gathering in Sacramento, where it was offered to Governor Jerry Brown to put up in the Capitol Lawn but instead it was arrested and confiscated by the Capitol Police. You can see the Rainbow Uprising Peace March for two minutes from 1hr14min-16min walking with the Hiroshima Peace Flame from the Tree of Peace, near the northwest corner of Storke Tower to install it on the UCSB Eternal Flame Memorial Peace Monument in the south lawn of Buchanan Hall, the capstone of a week of events to initiate the Rainbow Uprising of Consciousness Campaign featuring the traditional Hopi Messenger of Peace, the late Thomas Banyacya. 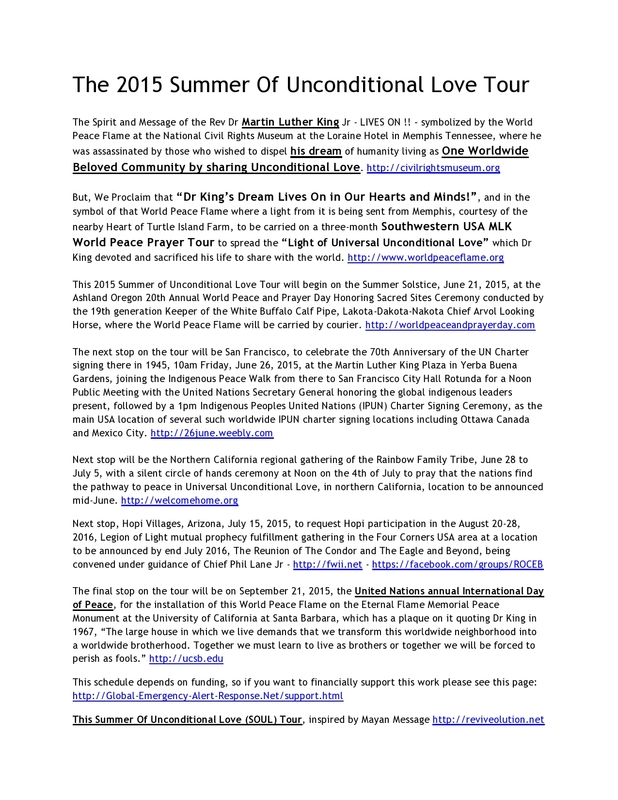 Let's repeat this on a bigger scale with live video and audio uplink and recording via the internet and multiple cellphone videographers, on September 21, 2015, the United Nations International Day of Peace, installing then the World Peace Flame from the National Civil Rights Museum in Memphis Tennessee at the Loraine Hotel where the Rev Dr. Martin Luther King Jr was killed for spreading his Message of Unconditional Love behind his vision for a Global Beloved Community, a vision we will be working to realize. 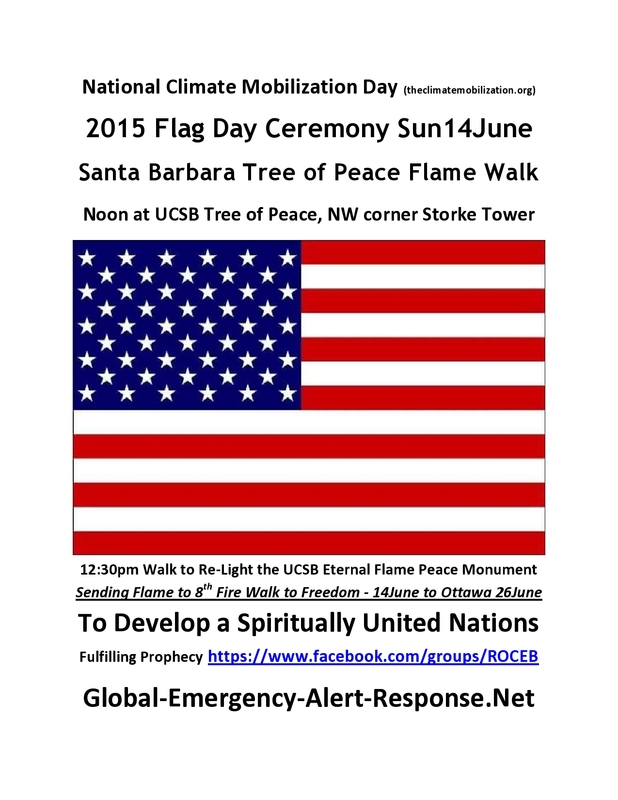 Let's have a dress rehearsal on Sunday June 14, 2015, Flag Day Noon at the UCSB Tree of Peace, near the NW corner of Storke Tower, to ignite a Santa Barbara Peace Flame, to carry and install in ceremony at the UCSB Eternal Flame Memorial Peace Monument quoting Dr. King, in the south lawn of Buchanan Hall. 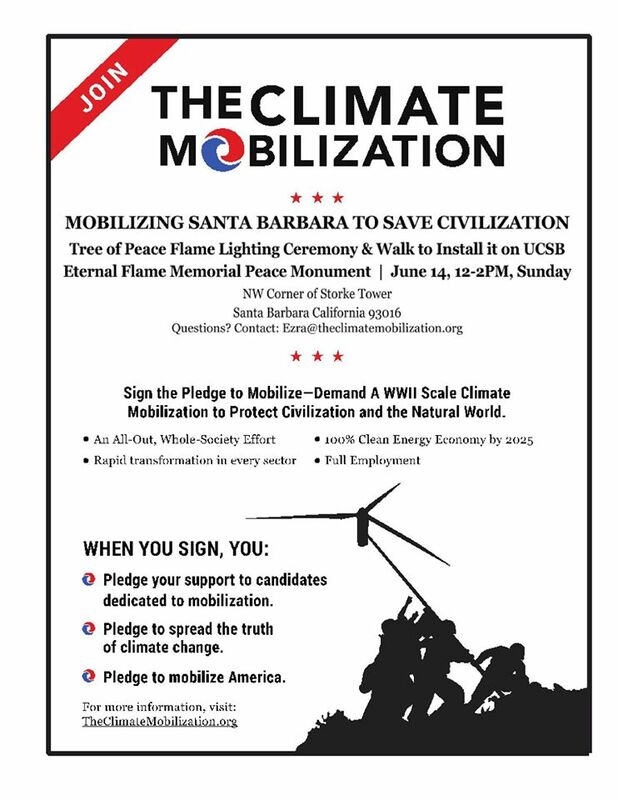 We hope the resources and determination will manifest to send a courier with a light from this Santa Barbara Peace Flame to join the 8th Fire Prophecy Walk to Ottawa that starts on June14 and ends on June26 at one of several worldwide locations for the signing of the Indigenous Peoples United Nations (IPUN). ------ The Rainbow Uprising of Consciousness Campaign - Santa Barbara Initiation Events, over a week in January 1990, featuring welcoming by Chumash medicine practitioner Choy Slo and Bear Clan Grandmother Pilulah Khus, Tree of Peace and Great Law of Peace teachings by Mohawk Chief Jake Swamp, Hopi Prophecy discussionsby traditional Hopi interpreter Thomas Banyacya (author of The Hopi Declaration of Peace), Nipponzan Myohoji Japanese Buddhist Monks lead by Rev YoshidaShionin with Masao Nippashi on opening drum, interview about Tibetan prophecy with Kenpo Karthar Rinpoche the abbot of the Kagyu Order's Karma Triyana Dharmachakra (KTD) Monastery in Woodstock NY, Zen Buddhist Monk and initiator of the 1995 Global Peace Walk project Rev. Yusen Yamato, a panel discussion including community leaders Gene Knudsen-Hoffman of the Fellowship of Reconciliation, Laura Lynch then with the Nuclear Age Peace Foundation and now a prominent anti-nuclear activist, Mark McGinnes of UCSB Environmental Studies Department and local SB Environmental Defense Center, scientist Bruce DePalma inventor of the n-Machine "free energy generator" proven in principle in Santa Barbara in 1979 under sponsorship of the Sunburst Community, with Hiroshima A-Bomb survivor Kaz Suyeshi who installed the Hiroshima Peace Flame on the UCSB eternal flame monument, Manzanar California WWII Japanese Concentration Camp survivor Judy Imai of the Global Walk for a Livable world which carried the Hiroshima Peace Flame after this event across the US from California to the United Nations, events organized and video narrated and produced by David Crockett Williams, filmed by Todd Swan of PAN Productions. At 1:02:20 Jake Swamp explains and shows Jon Voigt one wampum bead, which shell beads he says are traditionally strung, into belts like the one he is wearing over his shoulder, using wild hemp fiber. 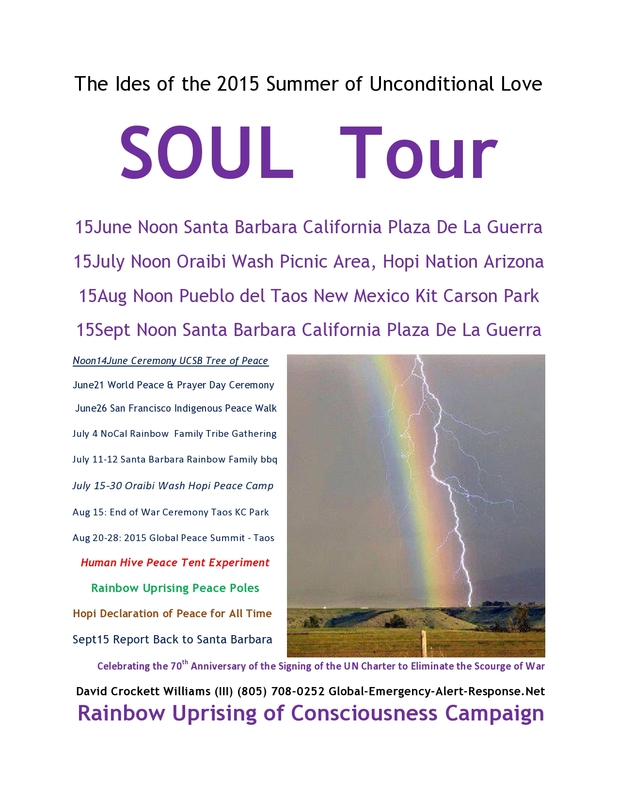 From 1:14:00 to 1:16:00 is shown the first Rainbow Uprising Peace March, from the UCSB Tree of Peace across campus to the Eternal Flame Memorial Peace Monument to install the Hiroshima Peace Flame there. Video 2hrs including actor Jon Voigt last 40 min talking at UCSB peace flame, including discussion about the late Chumash Elder Victor SkyEagle Lopez who had planted the UCSB Tree of Peace five years earlier with Jake Swamp, about the Iroquois message and system where he cited the Congressional record volume that acknowledges the significant impact on the US system of government which was patterned in large part on the Iroquois system based on the leadership of a council of women, and stories about Thomas Banyacya and the Hopi Prophecies including the one about the House of Mica. Jon was filling in for his friend Thomas Banyacya who had to leave early to go to the second Global Forum, in USSR, with satellite linked video of that including the global debut of Robbie Romero’s music video “Is it too Late?” whose graphics include scenes from Nipponzan Myohoji’s Peace Pagoda in London. A few years earlier Jon had arranged a press conference with Elizabeth Taylor for Thomas Banyacya to deliver the Hopi Prophecy message, which he did, but none of the many reporters present could explain what that message was, so they wrote internationally syndicated articles saying they could not understand what the message was!